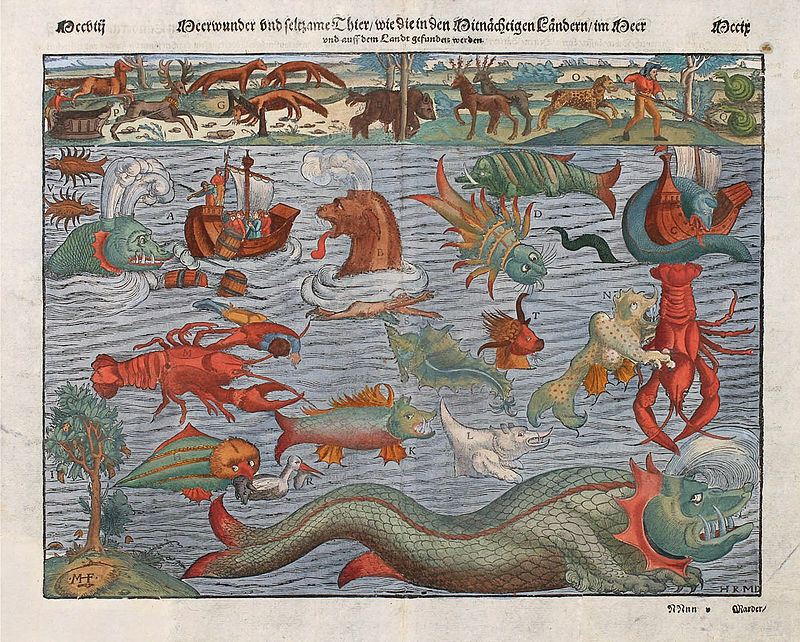 Last week the salon was visited by the legendary Kraken, and what a popular visitor he was! 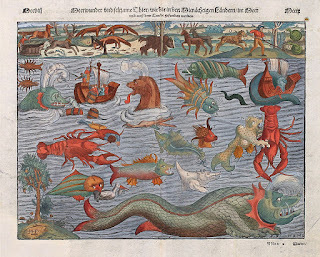 Today we welcome another tale of this legendary sea creature, from the news of 1776. 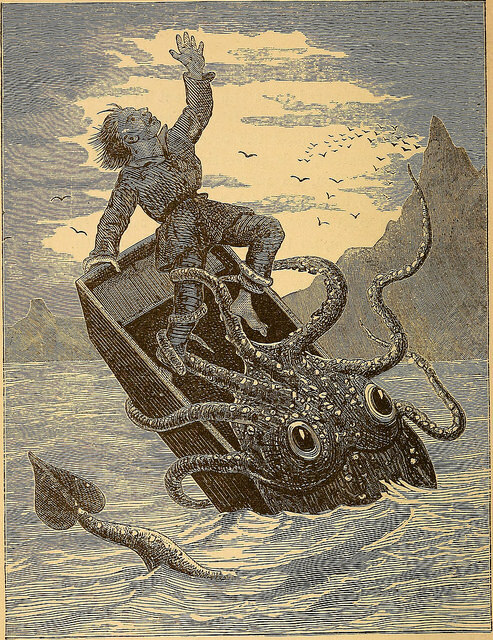 AS there are still some people who doubt the existence of the Kraken, notwithstanding the testimony of the ingenious Bishop Pontoppidan, in his Natural History of Norway, I inclose you an authentic Description upon the subject, which I doubt not will convince the most incredulous. If any one will enquire after Robert Jamieson, he will be found to be a man of unblemished reputation; and every one who is acquainted with the customs of the Western Isles must know that the Officers, before whom it was sworn, are of such weight there, as to preclude all idea of their having been wilfully deceived. 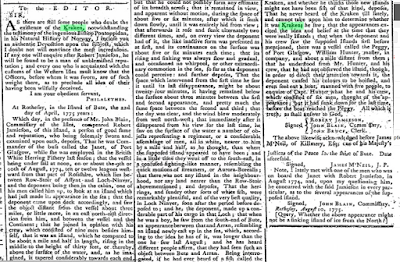 Which day, in the presence of Mr John Blain, Commissary of the Isles, three of the Isles compeared Robert Jamieson, this island, a person of good fame and reputation, who being solemnly sworn and examined upon oath, deposes That he was Commander of the buss called the Janet, of Port Glasgow, while she was employed in the British White Herring Fishery last season; that the vessel being under sail at noon, on or about the 9th or 10th of August, 1774, ten or twelve leagues westward from that part of Rossshire, which lies between Row-Stoir of Assynt and Loch-Ninver, and the deponent being then in the cabin, one of his men called him up, to look at an island which had just made its appearance in the sea; that the deponent came upon deck accordingly, and saw the object distant from the vessel about three miles, or little more, in the east north-east direction from him, and between the vessel and the Continent; that he joined In opinion with his crew, which consisted of nine men besides himself, that it was an island, which he computed to be about a mile and a half in length, rising in the middle to the height of thirty feet or thereby above the surface of the water, and, as he imagined, it tapered considerably towards each end, but that he could not possibly form any estimate of its breadth across; that it remained in view, and apparent without motion, during the space of about five or six minutes, after which it sank down slowly, until it was entirely hid from view; that afterwards it rose and sunk alternately two different times, and, on every view the deponent had of it, the like inactive form was presented as at first, and its continuance on the surface was about five or six minutes each time; that its rising and sinking was always slow and gradual and occasional no whirpool, or other extraordinary commotion in the sea, so far as the deponent could perceive: and further deposes, That the space which intervened from the first time he saw it until its last disappearance, might be about twenty four minutes, it having remained below the service about three minutes between the first and second appearance, and pretty much the same space between the second and third; that the day was clear, and the wind blew moderately from west north-west; that immediately after it disappeared from his view for the last time, he saw on the surface of the water and number of objects representing a regiment or considerable assemblage of men, all in white, nearer to him by a mile and a half, as he thought, than where the supposed island appeared to have been; and in a little time they went off to the south-east in a confused fighting-like manner, resembling the quick motions of streamers or Aurora-Borealis; that there was not any island in the neighbourhood, nor any land nearer than the Row-Stoir abovementioned; and deposes, That the herrings and sundry other sorts of white fish, were remarkably plentiful, and of the best quality, in Loch Ninver, soon after the period before deposed to; and he, the deponent, made up a considerable part of his cargo in that Loch; that when he was a boy, he saw from the south-end of Bute, an appearance between that and Arran, resembling an island newly cast up in the sea, which, according to the idea he has of it, was longer than the one he saw last August; and he has heard different people affirm, that they have seen such an object between Bute and Arran. 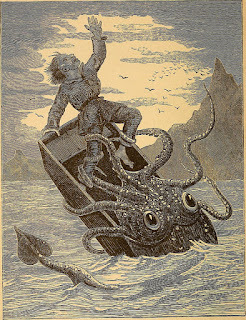 Being interrogated, if he had ever heard of a fish called the Kraken, and whether he thinks those new islands might not have been fish of that kind, deposes, That he had never heard of the Kraken till lately, and cannot take upon him determine whether it was Kraken he saw; that the appearances excited the idea and belief at the time they were really Islands; that when the deponent and his crew saw the supposed Islands first before mentioned, there was a vessel could the Peggy, of Port Glasgow, William Hunter, master, in company, and about a mile distant from them; that he understood from Mr. Hunter, and his crew, that he had not observed the island, though, in order to direct their attention towards it, the deponent caused his colours to be hoisted, and even sent out a boat, manned with five people, to enquire of Capt. Hunter what he and his crew, which consisted of six men, thought that the appearance, but it had sunk down for the last time before the boat reached the Peggy. All which is truth, as shall Answer to God. Note: I lately met with one of the men who was on board the Janet with Robert Jamieson, in August 1774, and, upon my questioning him, he concurred with the said Jamieson in every particular, as to the several appearances of the supposed island. From the General Evening Post (London, England), January 6, 1776 - January 9, 1776; Issue 6560. 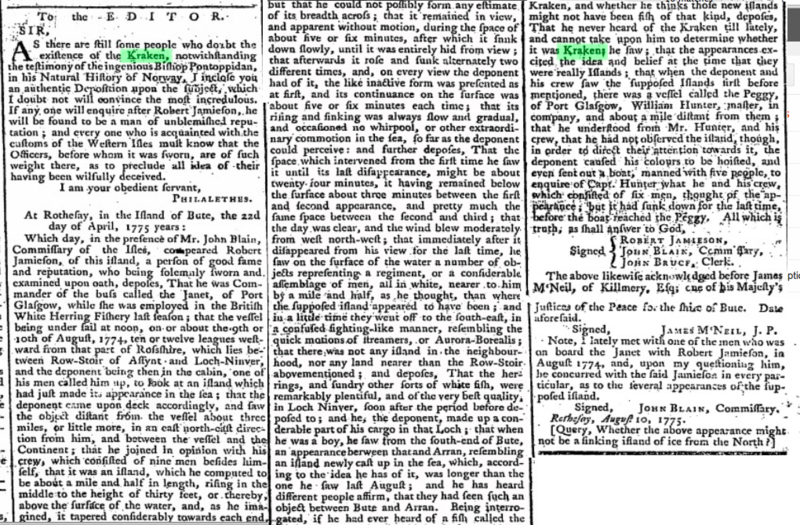 17th-18th Century Burney Collection Newspapers.